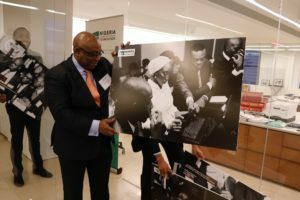 The Nigeria Higher Education Foundation (NHEF) hosted a Young Professionals Networking Event on Wednesday, March 21, 2019 at the Kuramo Capital Management office in New York City. 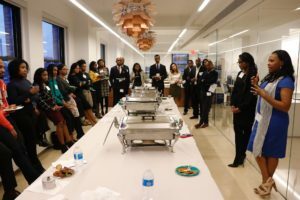 It provided young professionals with an opportunity to gain insight into NHEF initiatives and to network with their contemporaries from a host of industries. 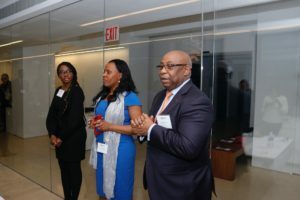 Attendees were able to hear directly from our NHEF leadership team about how they could support our mission of providing local and global resources to develop, sustain, and advance young Nigerian Scholars. Our team highlighted the importance of contributing time through several exciting volunteer opportunities. Among these include supporting us by serving as a judge on our essay competition committee, mentoring one or more of our Scholars, hosting a Friend-raising event on our behalf, cooperate sponsorship through your job and involvement in our Gala planning committee. The keynote address for the evening was delivered by Dr. Ifeoma Nwokorie of Cortlandt Manor Dental, who serves as the NHEF Vice Chair. Dr. Nwokorie was introduced to the Foundation when she attended the inaugural NHEF Gala in 2014. 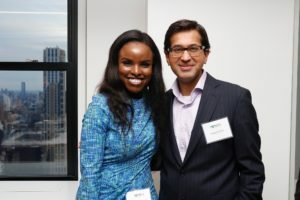 She was immediately drawn to our organization and has since then been involved as a member of the NHEF board committee, as an official interviewer for our Scholars Program and as the Vice Chair of our Gala Committee. It is through the involvement of passionate individuals like Dr. Nwokorie that we are able to thrive in our efforts. Our NHEF leadership team consists of devoted individuals diligently working to meet and exceed our goals. We are hopeful for a future where Nigerian higher education emerges as a global leader – one where Nigerian institutions become a hub for the world and foster the development of global scholars and leaders of the 21st century. With this development, we believe that Nigeria as a whole can change significantly for the better. If you would like more information on ways to get involved please contact us at info@thenhef.org. Donations can be made online via www.thenhef.org/support-the-nhef.